Every spring, approximately 25,000 Greater Sandhill Cranes cross through southern Colorado's San Luis Valley as they migrate north from their winter home in New Mexico. They start to arrive in late February, and by the beginning of April they are clearing out and moving on. 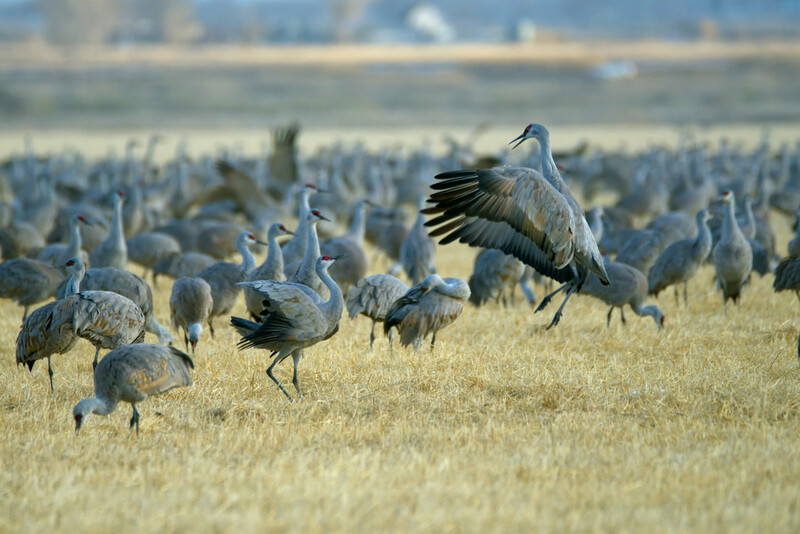 In conjunction with the city of Monte Vista, every year the Friends of the San Luis Valley Wildlife Refuges puts on the Monte Vista Crane Festival, usually over the second weekend of March. Having never gone down for this before, I targeted this event as one I wanted to catch this year. The events start on Friday morning, and continue through mid-day on Sunday. Events include sunrise & sunset tours to viewing locations, all day photography workshops, tours to locations in the valley during the day, movies being shown, a keynote address on Saturday night, and a craft/nature fair held through the weekend. While there is no cost to attend the festival, a donation is expected when you sign up for the tours or photo workshops. In the interest of full transparency, I participated in none of the festival events. What I did was researched the locations where the cranes could be expected, which are mainly in the Monte Vista National Wildlife Refuge, and took advantage of the timing already plotted out by the festival organizers. This allowed me to set my own schedule, while still trying to be at the locations at the prime times for the best viewing of the cranes. I'm personally happier that way, but you may feel differently. You can use the links above if you wish to research the event yourself. Driving down to the valley from the Denver area with my family, we arrived in time to get settled in our motel in Alamosa and then head out to the refuge in the last hour before sunset. If it's your first time experiencing something like this, the volume of sound that 20,000 birds make is something you won't be prepared for. I've included a video at the bottom of this post, so be sure and turn up your volume and have a look, (apologies for the wind noise, it's Colorado). The photo at the top of this post of the mass takeoff was also taken on Friday night. As it starts to get dark, groups of cranes break off and head to their roosting sites in the surrounding wetlands. This provides plenty of opportunity to see the birds taking off, flying overhead, and sometimes landing back in the field to eat some more before heading out for the night. 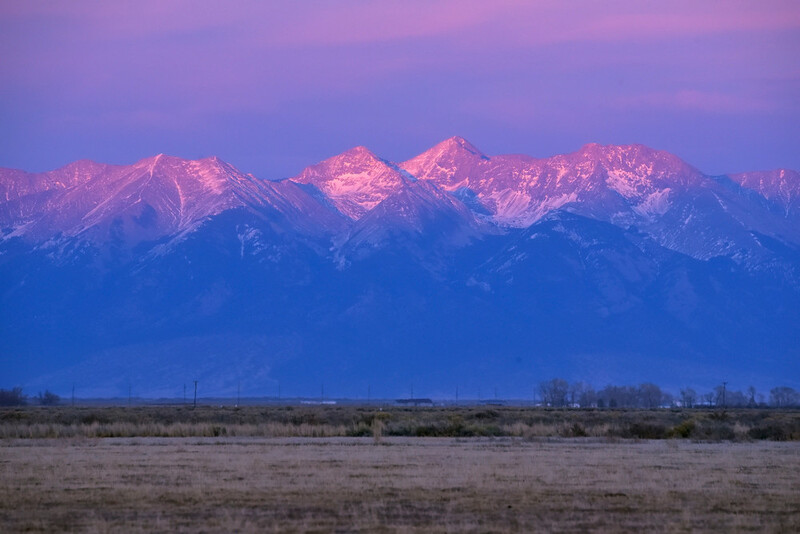 The sunset view of the Sangre de Cristo Mountains on the east side of the valley was also spectacular. The next day, we did some more exploring in the valley, including the Alamosa National Wildlife Refuge. As late afternoon arrived, we returned to the Monte Vista refuge to see the cranes again. There are various locations in the refuge to view them from, but on this weekend at least they had one particular open field that most of them gathered in. We stayed out until it was just too dark to take anymore photos, and as I was packing up my gear, the final group of cranes took off and headed to their roosting spots for the night. After a short night of rest, (it was also time change weekend), I headed out just before dawn to return to the refuge to try and get some photos of the cranes in the wetland areas. As it turned out, even though I was there by sunrise, I was too late and they were already gathering in the open field again. What was different about being there in the morning was their behavior. The cranes were more actively interacting with each other, some would stir up some of the others, and they would engage in something like a dance for a few moments, jumping around and flapping their wings. Those moments happen fast, but I was able to capture them in a few photos. I stayed out shooting for an hour and a half or so, and then headed back to the motel for breakfast and to prepare to return home. While in the valley, at least a short trip to the Great Sand Dunes NPP was in order as well, and I was able to capture a few photos there too. In summary, I think this is definitely something worth being there for. It's a unique experience to see so many birds just filling up the space. Besides the sandhill cranes, you'll also see some Canadian Geese mixed in, and probably some ducks, owls, and raptors as well. Maybe next time I'll even check out some of the Festival events. I think it's going to be on my calendar again for next year, so come check it out with me! If you haven't signed up for my email list yet, you can do that by entering your email address in the subscribe box right here. You'll receive a new customer discount code as a thank you for signing up. If email isn't your thing, you can also sign up to receive my updates via Facebook Messenger. Just click that link, and you'll get the same benefit there as well. If you're enjoying following my posts here on my blog, don't forget to follow me on Facebook & Instagram as well. You'll often see my newest photos there first. Thanks for following along!